State Department confirms for the first time that Anne Patterson held talks with Yemen’s Houthi militia in Oman. The United States confirmed on Tuesday that an American ambassador has held talks with Yemen’s Houthi militia in Oman, AFP reported. Washington’s top diplomat for the Near East, Anne Patterson, had a number of meetings in Oman with parties involved in the Yemen conflict “including with representatives of the Houthi,” State Department spokeswoman Marie Harf confirmed. Patterson also then travelled to Saudi Arabia for talks on the conflict with Saudi leaders and with exiled Yemeni President Abed Rabbo Mansour Hadi, who fled his country earlier this year to seek refuge in Riyadh as the militia captured parts of the country. The meeting with the Houthis aimed to “reinforce our view that there can only be a political solution to the conflict in Yemen and that all parties including the Houthi” should participate in “the UN-led political process,” Harf said, according to AFP. Patterson’s meetings “were really focused on getting the different political constituencies to attend the planned talks in Geneva,” added the spokeswoman. The Geneva conference had been due to take place on May 28 but was postponed after the UN failed to persuade the warring parties to attend, despite the fact that Houthi leader Abdul-Malek al-Houthi had originally agreed to the talks. 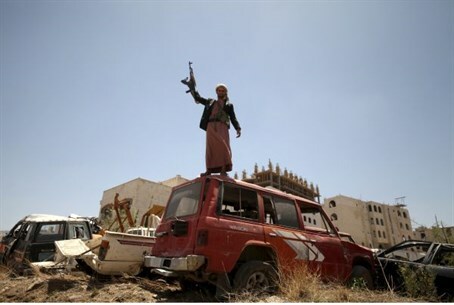 A Saudi Arabian-led alliance began launching airstrikes on the Houthi rebels on March 26, aimed at restoring exiled Hadi.